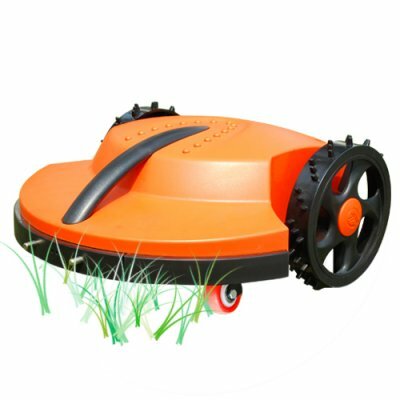 Successfully Added Robot Lawn Mower - Automatic Electric Robomower (220V) to your Shopping Cart. The robot lawn mower, also known as an electric robomower, is used for automatically cutting your grass lawn. This 220V version has a recharging station for use with 220-240 volt power supplies. You can use the included boundary kit to set up a perimeter around your lawn and have the electronic robot mower trim automatically (without any guidance). You can use the provided remote control to guide it yourself. For people who have allergies or who are just simply tired of mowing the lawn, this electronic lawn mower could well win their personal product of the year award! Trimming your lawn does not get any simpler than this - all you need to is to set up a perimeter around your lawn, charge up your robomower, set it up to go in a straight line starting from the edge of your yard, turn it on and let it do the work for you! Enjoy sipping some lemonade on the porch during those hot summer days while your new robo buddy does all the hard work for you. This is a mulching style mower, meaning it cuts your grass and leaves the tiny trimmings on the lawn - it has no cumbersome bag to empty. This makes it a great gift for yourself or your parents. The electric robomower is offered exclusively to our customer base at a low wholesale cost and with no minimum order quantity (M.O.Q.). Automatically cuts your lawn for you. Electric mower = no need to buy gas + no noise. Please note the power supply of this product is for use with a supply voltage of 200V-220V. Should you require a 110V model please order CVFN-OG01-110V. Quiet electric powered mower - good for the environment and saves money since you do not need to buy gas. Safety auto stop when mower blades are not facing down. Mulching system compacts grass into small clippings that decompose naturally on the lawn, improving your lawn's health while lightening your workload. If you find that you need additional perimeter wire, we recommend using 14 gauge THHN solid copper wire found in your local hardware store. Is it really that easy to use? Yes it is! Just like painting, preparation is the key to using this product properly. So how do I prepare my lawn properly? Using the included wire and stake kit you need to make a perimeter to help guide your robomower around your lawn where you want it to cut. The simple tension provided by the wire tells the robomower when to change direction. If you have an extra large lawn you will need to buy additional wire to make a bigger perimeter for the robot mower to work in. Do I need to place the charging station within the mower perimeter? No. Putting the station within the perimeter means the mower can go "home" when it has finished mowing the lawn. However, you can choose to let it mow until it is done and use the remote to turn it off or let it keep going until its power runs out. I have a uneven lawn, will it work for me? Yes. The robomower can easily navigate small hills and slopes. However the front wheels can get caught in baseball sized holes so a walk-through of your lawn is advised and any repair work on mid-sized holes should be done before deploying your new robomower. Can I adjust the cutting height? The shipping height of the blades is approx 4 centimeters (1.6 inches). Expert DIY users will find that it is possible to adjust the blade height, however we recommend most users to not attempt to change the cutting height. What voltage is the motor of the robot lawn mower? The voltage for the robot lawn mower is 24 volts.